Boarding is from either the swim platform then port-side steps to the aft deck, or from boarding doors located both port and starboard on the aft deck.The Dyna Lauguna has a comfortable Aft Deck with built in seating, same-level Salon with built in furniture, a day head, and a raised Galley and Dinette area. Below are three cabins, with the VIP stateroom forward, and the Guest Cabin with two single berths midships on port. Both the VIP and Guest Cabins have their own en-suites. The full-beam master has a king size bed on centerline, and has a private head and shower. 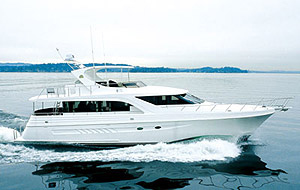 The Engine Room is accessed from the crew quarters.The large crew cabin is easily accessed via a custom transom door from the swim platform and offers an additional two single berths, a seating area with table, a small galley with fridge and microwave,an abundance of storage, and a full head with toilet, sink and shower. Stacked washer and dryer are located in the crew's quarters. The Bridge Deck features a fully enclosed SkyLounge, and has easy access via comfortable stairs from the interior of the vessel. The enclosed SkyLounge has a fully-equiped navigation station, and matching curved settees with coffee tables port and starboard. A covered deck with integrated seating is aft on the Bridge Deck, as is the davit. Entering through spacious stainless steel entry doors, the beauty of this vessel is immediately apparent. The natural cherry wood provides a wonderful backdrop for the interior design and appointments, and the vessel's beam and windows combine to present a bright, spacious feeling. The salon has a white leather sofa that seats four to six people on port, and features a custom curved cherry coffee table with artistic inlays also to port. The sofa is L-shaped. There are two blue fabric-covered tub chairs aft on starboard, with a beautifully-detailed table and six high back tufted chairs forward. Custom gold fabric roman blinds, and the contemporary ceiling detail combine with the natural cherry to create a most inviting space. A 42" Panasonic TV, a Bose entertainment center, a 24-bottle wine cooler and an ice maker round out the salon equipment. Two steps up from the salon on starboard are the stairs to the SkyLounge and a day head. Forward are the galley and dining areas, with the Galley on port and the Dinette to starboard.The staircase to the SkyLounge is curved, and provides easy access to the bridge from the interior of the vessel. The acrylic and stainless in the staircase are very pleasing visually, and provide for safety while underway.The sole of the Galley is a marble tile with an inlay, and the sole of the Dinette is hardwood. All the way forward and to starboard is the dinette, with navy blue leather upholstered seating for 6 people. Two navy blue ottomans augment the fixed seating at the dinette. A cherry and burlwood dining table sits on a cherry column pedestal. The dining area is raised to offer better exterior visibility. The galley and dinette areas offer ample light from the forward and side windows, and the ceiling detail includes numerous pot lights. Six curved steps each lead to the accommodations below. The companionway draws light from the windshield above, and the curved detailing above makes for a most pleasing passageway. At the bottom of the stairs one can proceed aft to the Master Cabin, or forward to port to the Guest cabin with guest head, or all the way forward to the VIP cabin and VIP head. The Master Cabin is aft. A king size bed is on centerline for comfort, and has a storage cabinet below. The master bed has a contemporary fabric headboard, and the stateroom has curved ceiling panels following the contour of the bed. The headboard is affixed to the aft bulkhead, and there are reading lights on both sides of the headboard. Built in three drawer cherry nightstands flank the berth. To port is a built in vanity with a swing-out seat. The vanity has space for seating, and built-in cabinets for storage as well. To starboard is a built-in settee, ideal for reading or for relaxing. The master has two portholes on port and two on starboard, providing natural light to the stateroom. All portholes have integrated screens. The electronics in the Master cabin include a 20” built in Panasonic TV, and an Onkyo DV-SP301 DVD. The master cabin has two hanging lockers, each with 2 drawers below. The en-suite Master Head has a hardwood sole, a cherry vanity with a storage cabinet and four drawers below. The Master Head features his-and-hers (under mount) sinks in a marble countertop above. The large shower stall has a clear glass double doors, and a teak floor. The toilet is a VacuFlush. The Guest Cabin has two single beds, designed with natural cherry and burlwood accents. The cabin has a hanging locker outboard with 3 drawers below, as well as overhead cabinet storage. Each bed has a contemporary reading light, and there is a cherry nightstand with storage below between the beds. Also in this cabin is a 15" Dynaview flat screen TV, a Sony CDX-S2000SCD-R/RW EQ3 player, and AC controls. The Port Guest Head has a hardwood sole. The cherry vanity has one cabinet below, and the countertop is granite with an undermount sink. The shower has a clear bi-fold door, and a teak sole.The toilet is a VacuFlush. The VIP Cabin is entered via a custom cherry door. The queen size berth sits on centerline with a custom headboard off the forward bulkhead . A mirror and twin reading lights sit above the headboard. There are two sets of doors for storage at the foot of the berth. There is rope lighting around the bed trim. Built in cherry cabinets both port and starboard serve as nightstands. The port cabinet has two drawers, and the starboard cabinet has 3 drawers. Above is a 20" opening stainless steel hatch with cherry trim and screen. There are two portholes with screens, one port and one starboard, and the blinds match those in the salon. Aft to port is a hanging locker with 2 drawers below. On starboard, there is a matching hanging locker with storage below. 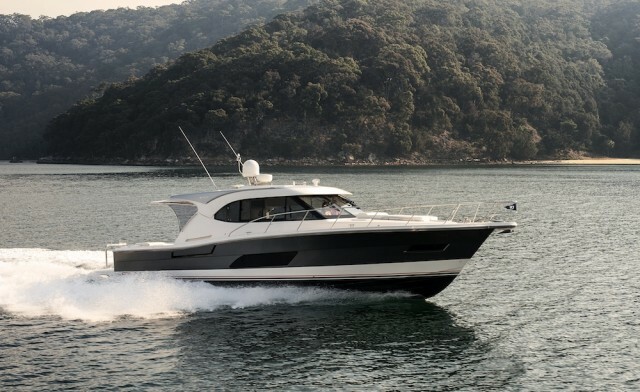 On the aft bulkhead is a built in 20" Panasonic flatscreen TV.The cabin is also equipped with a CDX-S2000SCD-R/RW EQ3 player. Also in this cabin are digital AC controls and a CO monitor. The VIP Head has a hardwood sole. The cherry vanity has one cabinet below, and the countertop is granite with an undermount sink. The shower has a clear glass door, and a teak sole.The toilet is a VacuFlush. 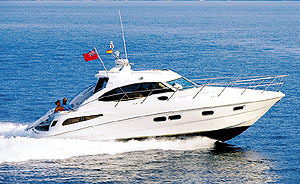 Stern cleats port and starboard, 12"
Entered via the transom door is a fully-equipped, well appointed crew cabin. The enclosed SkyLounge is has a fully-equiped navigation station, two Todd high back swivel helm chairs, and a separate raised seat for two guests. 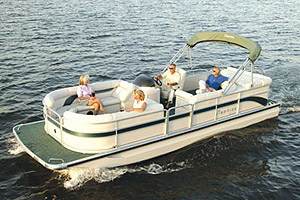 The bridge seating provides excellent visibility and comfort for all during extended cruising. Aft in the SkyLounge are matching curved settees with coffee tables, ideal for entertaining or for relaxing while underway.The SkyLounge is accessed from the interior of the vessel via a curved stairway, and can also be accessed by integrated FRP steps port and starboard from the aft deck. There are two Pantograph doors to the catwalk, forward of the curved settees. Moving aft from the enclosed SkyLounge, passing through two large custom curved stainless-framed doors, is an integrated, curved bench seat with comfortable seating for 6. A console with sink and fridge is under the cover of the FRP roof in this area. Passing aft through stainless steel gates port or starboard provides access to the 1400 lb capacity Opacmare davit. Six to eight people are accommodated comfortably on the Bridge Deck. 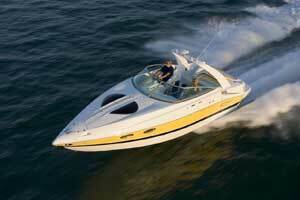 (2) 8D batteries for house, (4) 4D batteries for engine starting, 2 for port, 2 for starboard.